As a social media manager, you should be aware that the nature of your job keeps evolving. While many companies make sure to have adequate social media managers, others outsource their job. 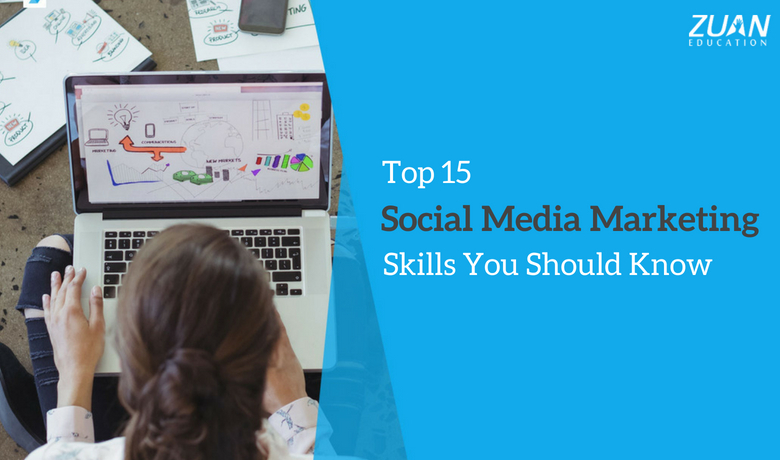 In this post, we have gathered 15 essential social media marketing skills that are crucial to being a great social media pro. Let’s have an in-depth look at social media marketing skills you should have in 2018. Strategy planning requires you to understand how search, content and social media are closely related to each other. You have to chalk out your goals, identify the type of audience and find out which platform would boost your efforts. Once the strategy has been figured out, you have to implement it through seamless efforts like blogging and creation of videos, images, graphics, tweets and other social media tryouts. Tactical execution calls for giving great attention to every detail and recruiting responsible manpower to ensure smooth flow of the process. Community management involves careful managing of social conversations within your brand community. It can be on any social platform. You cannot shun away from bad or negative responses rather learn to handle them. As a social media manager, you act both as PR and with little common sense. A social media marketing person should know what contents work on social media. You should define for yourself a place and like to choose between different media formats such as text (articles), video, images or podcasts so that you can bring out the best. You also need be a viral craze, learning to create viral hypes and other viral contents on Facebook, Twitter, YouTube etc. The social platform is a network of search and contents. Hence contents with appropriate keywords are essential to guide customers to your webpage. To put it in simple terms, your content should be SEO optimized. This is the alignment between content and technology. Repetitive content about a brand for a prolonged time will make the customers lose interest in the brand itself. Therefore periodic input of creative and engaging contents will hook the customers to your brand. In order to stand out in the competition, as a social media marketer you would need to constantly engage your mind to come up with innovative contents. Relationship building should be the end result of the power and credentials of the brand itself, to automatically attract people to your brand. On the other hand, it should not end up in spams and direct messages on social platforms pleading people to follow you. Your content should be readable. This should incorporate titles, subtitles, bullet points, highlights, etc. Apart from having social media marketing skills, you should have to keep yourself abreast of the latest digital marketing trends as technology keeps evolving. For example, knowledge about similar things as found below is essential to attract potential customers. Update yourself on current mobile marketing. The recent shift to “pay to play” strategy by Facebook from its organic reach and other developing changes in social media platforms have to be diligently explored. Instagram and Twitter have recently enlarged their scope of communicating large amount data in one instance. As a social media marketing professional, you must have a great analytical skill. It is one of the important skills to get succeed in this career. Analytical skills are a boon to your business. Analytical tools help you to monitor the effect of your campaigns and marketing initiatives on social media platforms such as Facebook and Twitter. Based on this, you will be able to take decisive actions to expand your business. You have to ensure the gathering of relevant information on any particular topic from a viewpoint of the liking of the customer which in turn enhances the curation process and better addresses the social media marketing agenda. As a social media manager, you have to constantly update the management, keep the team constantly passion-driven and keep your customers always in an upbeat. It is one of the vital social media marketing skills you need to have and this necessitates a regular honing of your verbal and written skills. Social media is a huge, infinite platform that keeps evolving. Managing such a huge mammoth requires carefully planned time management to wisely execute things. Make sure, your team members are allotted specific task-based timings and don’t mess up things. Social media is not only about posting a content and then logging out and later logging in and doing this repeatedly. Excellent communication on your part is essential to always engage with the audience or the community and boost the company’s profile. Most important, is to positively engage the audience which gives an upper hand in social media marketing. The aforementioned social media marketing skills would definitely spruce up your drive for social media marketing or digital marketing. Moreover, as technology constantly evolves imbibing new skills will further enhance your growth opportunities. Embrace social media and its vast scope of doing successful marketing intelligently.